This 12 Volt Professional Grade battery is an excellent value. We send you (1) 12 volt 35ah, with a CCA ( Cranking Amps) rating of 300. 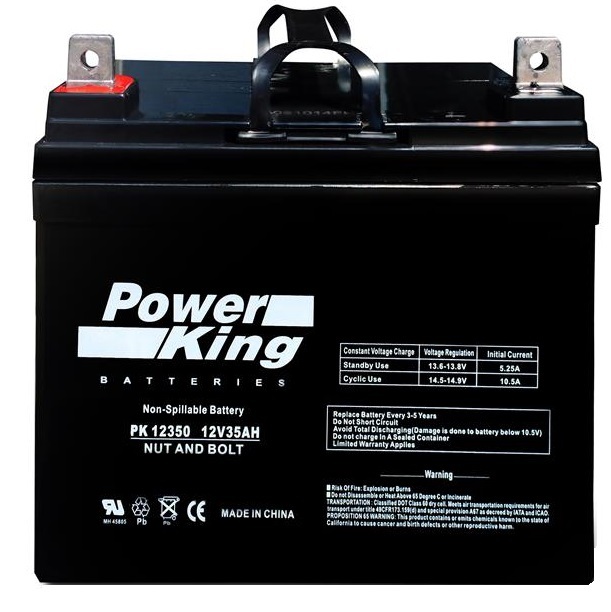 This Power King Mower battery is guaranteed to meet or exceed OEM specifications at a reduced price. Our batteries are made from the highest quality parts and are 100% compatible. Only installed this battery a couple of weeks ago on a John Deer LT133. So far, works great. Easy to install, fit perfectly, and fired up the first time. Can't speak to how long it will last, but we'll see. The cost seemed a bit higher than others, but the quality seems to be worth it. Given performance thus far, I would recommend this battery. Came fully charged and fit perfectly in the old battery slot. Provides good cranking power and seems to hold its charge. Easy to install. Wow, what a battery! Go for it. Ordered this battery to replace the stock John Deere battery in my LA100 mower. It fit perfectly and the dimensions were correct. I was worried that it might not fit/work, but it was easy to swap out (less than 5 mins) and once it was connected my mower started quickly on the first try and has continued to do so since. A prefect fit for my Gravely zero turn. The battery holds a charge well, and has enough power to effortless crank the engine. The battery is supplied with new terminal hardware (2 nuts and 2 bolts) , which was useful as one of my bolts had started to corrode. Worked great. Never had any problems with this battery. Starts lawn mower every time. Great battery. Well worth the money I paid for it.